Everyone faces those moments when you get a call to say visitors are on their way just when your home is a mess! Don’t panic – if you have an hour, a logical system and the energy to throw yourself into it non-stop, you will triumph. 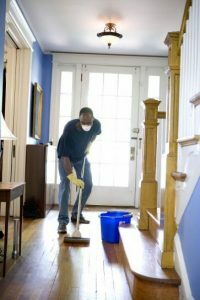 Your home may not be show home ready, but it will be clean and tidy enough for now. You can always find a Cheltenham carpet cleaning company for a deeper clean at a later date. – Start with the highest level of the house if you live in a two- or three-storey home. – Carry cleaning products and cloths with you. – Do not get distracted. – Never return to a room once done. – Allocate your time logically. In bedrooms, simply straighten the beds if needed, open the curtains, empty any overflowing bins, and tidy/hide clothes and other debris. Vacuum any obviously dirty patches of floor. Clean the toilet bowl, lid and cistern, add toilet bleach, then wipe over the sink and the bath/shower if grubby. Don’t forget to shine the taps and the cabinet mirror. Empty the bin and put out fresh towels and a new toilet roll. Finish by flushing the loo, spraying some air freshener or opening a new reed diffuser, and quickly running the vacuum over the floor. If possible, wash any dishes and leave them to drain; if not, put them into a bowl and hide this in the oven or under the sink. Spray and wipe all countertop space, which should now be clear. Empty the bin and wipe it if needed. Run the cloth over your cooker surface and the fridge door, and quickly sweep or vacuum the floor. Vacuum the carpet you can see, dust the eye level and lower surfaces with nice-smelling polish, and give any grubby mirrors a wipe. Collect clutter and hide it somewhere, then remove the sofa cushions and vacuum underneath them. Make a note to contact a Cheltenham Carpet Cleaning Company to tackle the carpets later. Throw any items cluttering the space into bags and leave them under the stairs. Vacuum the larger areas; if there is time, do the stairs too. This is easier with a handheld device.